#5 - 08/17/2008 Spider-Man's dialogue is a nice bit, and the Vulture splayed on the ground like that is sort of funny, I guess. 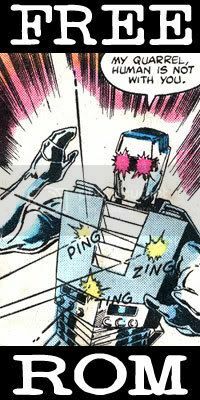 Still, it doesn't pack that certain oomph I'm looking for. #4 - 08/22/2008 In context, this panel is pretty shoddy. Out of context, however, it manages to shine because you have no idea what Mary Jane took, and why she's whispering to Spider-Man about it. Spider-Man also looks mildly confused, as confused as a masked man can look. 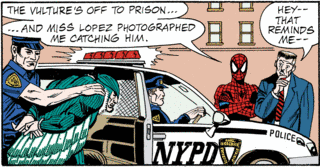 #3 - 08/20/2008 I just like the Vulture being shoved into a police car in full costume and hand-cuffed. There is no way that should really work in any way. Jazz Spider! JAZZ SPIDER! JAZZ SPIDER! I also just noticed that it doesn't exactly look like Jameson's seemingly mobile head is looking at the camera. I realize that the perspective is out of whack, but still... eyes up, Jonah. 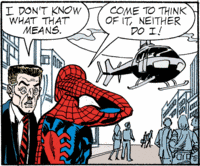 #1 - 08/18/2008 A good out of context panel should be a little funny, and it should lend itself nicely to wild speculation on what's actually happening: "Spider-Man and Jameson walked through the ethereal city, both confused as anything when the helicopter came." The only reason this beat out this week's #4 is because I found this one funny the first day I read it. Which is not to say humor is the only quality that's looked for in a Panel of the Week. Perhaps next week we'll get one that's just nice for different reasons. Wow, that was a quick week. If it wasn't for entertainment in the media, I wouldn't know when one day ended and the next started.